Have you been wondering exactly how so many successful marketers are able to create incredibly profitable sales funnels that generate thousands of dollars with every launch? The reality is, if you want to maximize your income so you can squeeze every possible dollar from your product launches, you absolutely need to master the art of creating high-converting sales funnels. It also amplifies a typical marketing strategy so that you’re able to maximize profits and build your tribe. And it extends the life of a product launch. To begin, you’ll want to spend some time analyzing successful sales funnel in your market. Pay close attention to the price points that you’re introduced to along the way. What kind of upsells do they offer? A sales funnel also helps to qualify traffic. It separates the action-takers from the tire-kickers. It works to create awareness of your brand, and to test out different price strategies to find the sweet spot. Your sale funnel’s objective is to move traffic, and then convert that traffic along the way. You’re inviting people into your funnel in order to connect with potential customers and provide them with various options so that you’re more likely to get the sale. The one thing that many people overlook is that your funnel doesn’t have to begin with a sale. In fact, you should look at the top of your funnel as the exploratory stage, where customers are first introduced to your brand and are looking for reasons to buy from you. This means that your funnel may not begin on a sales page at all. It could start by funneling traffic into a mailing list in order to build your subscriber base and connect with your audience. Do you want to build a mailing list of people who are interested in your niche so that you can introduce them to new offers? Are you looking to start selling right away by creating a traditional sales funnel that begins with a low-cost front end product? Do you want to gather important information from prospects through lead magnets, free trials, or free products before introducing them to paid offers? We’ve just discussed how the top (entry) of your funnel doesn’t always have to involve selling. In fact, for many this is the last place where they’d even consider doing a hard sale. Typically, the top of your sales funnel is the introduction phase. As I’ve previously mentioned, it’s where you allow people to get to know your brand, test the waters, and make the decision as to whether you have something valuable to offer. Set up a lead-capture page. This can be a responsive squeeze or landing page. The focus needs to be on capturing the lead via an opt-in form that adds the subscriber to your mailing list. You’ll want to offer something of value in exchange for their email address. Think about the different type of products featured within your funnel and offer them a condensed version of a product, or something else that is relevant to your market. Don’t overlook the importance of a lead magnet! If you want to maximize conversion rates, you’ll want to offer them something irresistible that instantly attracts attention. A free special report, an email-based course or a series of videos are always great ideas. These guys know their stuff. The lead magnet packages come fully bundled with everything you need making it drop-dead easy to get your funnel up and running in a matter of a few minutes. This part of your funnel is incredibly important because it’s what helps you learn the most about your audience, such as what type of products and services they are most interested in. It can provide you with the inside information needed to create in-demand products while making it easier to cross-sell or upsell to your customers with related products. Your funnel’s middle segment is where you may also begin to soft sell. 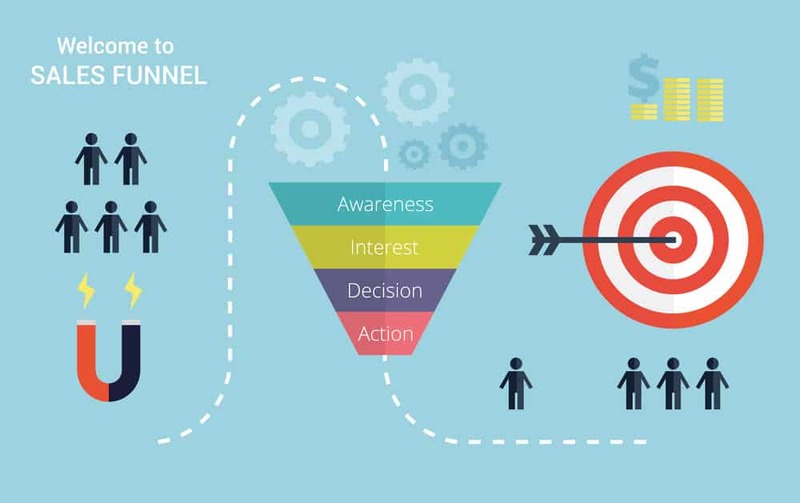 Keep in mind that the goal is to strengthen your relationship with your audience as you guide them to the final stage of your funnel: the bottom. And finally, the bottom of your funnel. This is where you combine a balance of hard and soft sales. Depending on how well you’ve worked at connecting to your audience throughout the top and middle sections of your funnel, you should have a strong tribe by the time they reach this step. You can see an example of a typical sales funnel on the next page. For example, you are going to have subscribers who are customers and subscribers who are leads. With leads, you haven't yet developed a relationship with them. They might be interested in your offers, but they have yet to act on it. Their relationship with you exists only through your email communication. With customers, they've already purchased from you already, and have proven to be motivated, active buyers. Your relationship with these people is different from leads, because you're able to establish a buying pattern and to demonstrate your ability to provide quality. They know what your products are like, what your style is, how you've set up your sales funnel. They are the most valuable subscribers you have. This is why it's critical that you segment your lists. You need to be able to communicate with the two groups separately, as with one you're working on conditioning them to purchase from you, while with the other, you need to nurture a relationship to help get them to that stage in your funnel. You should spend most your time testing your opt-in rates, so that you can maximize the number of subscribers while also being able to test a market’s overall demand. Since it's a lot easier to convince someone to subscribe to your newsletter than to purchase a product, you'll be able to collect a lot more data based on visitor actions than even with your sales pages. The more traffic you are able to send to your squeeze page, the more subscribers you'll get, so you need to make list building a CONSISTENT part of your marketing campaign. Let’s say that your sales funnel is currently converting only one sale out of every 100 visitors. And for this example, your product is priced at $20.00. If only one visitor out of 100 purchase your product, your conversion rate would be 1%. Begin by deciding on what your front-end (top) will look like. What ideas do you have that would influence a visitor into entering your funnel? Do you want to take advantage of powerful lead magnets that will motivate visitors into subscribing to your mailing list?